We conducted an analysis of data collected during the Veterans Affairs Diabetes Trial (VADT) and the follow-up study (VADT-F) to determine whether intensive (INT) compared with standard (STD) glycaemic control during the VADT resulted in better long-term kidney outcomes. VADT randomly assigned 1791 veterans from 20 Veterans Affairs (VA) medical centres who had type 2 diabetes mellitus and a mean HbA1c of 9.4 ± 2% (79.2 mmol/mol) at baseline to receive either INT or STD glucose control for a median of 5.6 years (randomisation December 2000 to May 2003; intervention ending in May 2008). After the trial, participants received routine care through their own physicians within the VA. This is an interim analysis of the VADT-F (June 2008 to December 2013). We collected data using VA and National databases and report renal outcomes based on serum creatinine, eGFR and urine albumin to creatinine ratio (ACR) in 1033 people who provided informed consent to participate in the VADT-F.
By the end of the VADT-F, significantly more people who received INT treatment during the VADT maintained an eGFR >60 ml min−1 1.73 m−2 (OR 1.34 [95% CI 1.05, 1.71], p = 0.02). This benefit was most evident in those who were classified as at moderate risk (INT vs STD, RR 1.3, p = 0.03) or high risk (RR 2.3, p = 0.04) of chronic kidney disease on the Kidney Disease Improving Global Outcomes (KDIGO-CKD) at the beginning of VADT. At the end of VADT-F, significantly more people from the INT group improved to a low KDIGO risk category (RR 6.1, p = 0.002). During the VADT-F there were no significant differences between INT and STD for average HbA1c, blood pressure or lipid levels. After just over 11 years of follow-up, there was a 34% greater odds of maintaining an eGFR of >60 ml min−1 1.73 m−2 and of improving the KDIGO category in individuals with type 2 diabetes who had received INT for a median of 5.6 years. VADT clinical trials.gov number: NCT 00032487. The online version of this article ( https://doi.org/10.1007/s00125-017-4473-2) contains peer-reviewed but unedited supplementary material, which is available to authorised users. Type 2 diabetes is the leading cause of end-stage renal disease (ESRD). Several large trials have demonstrated a favourable but relatively modest effect of intensive glucose control (INT) on microvascular complications in type 2 diabetes [1, 2, 3, 4, 5]. Whether the pursuit of INT to reduce the rate of chronic kidney disease (CKD) and other vascular complications is worth the provider effort, cost and patient burden is an important clinical question. 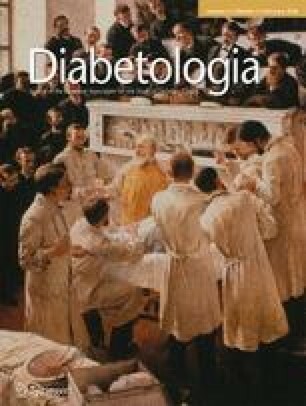 The Veterans Affairs Diabetes Trial (VADT) was a randomised, prospective, multicentre study in participants with type 2 diabetes who received either INT or standard glucose control (STD) for a median of 5.6 years to determine whether INT would reduce incident cardiovascular disease (CVD). At baseline in the VADT, the mean age was 60.4 years, duration of diabetes was 11.5 years, HbA1c was 9.4% (79.2 mmol/mol), blood pressure was 132/76 mmHg and eGFR was 83.1 ml min−1 1.73 m−2. The objective of the current analysis from the VADT follow-up study (VADT-F) was to determine the long-term effects of INT vs STD glycaemic control applied for a median of 5.6 years (during VADT) on renal outcomes over an additional 6 years of follow-up. The design and primary endpoints of the VADT and VADT-F have been published previously [1, 6, 7]. During the VADT, participants with type 2 diabetes mellitus were randomised to INT or STD glycaemic control with the goal of HbA1c reduction of 1.5% in the INT group . Of 1578 participants alive at the completion of the VADT, 1033 (65.4%) provided written informed consent to participate in the VADT-F (electronic supplementary material [ESM] Fig. 1). After conclusion of the interventional phase of the VADT, participants in the VADT-F received routine diabetes care through their usual healthcare team. Hypertension and hyperlipidaemia were equally and aggressively treated in both groups. Data were obtained from Veterans Affairs and National database searches (see ESM Methods) . The median in-trial, post-trial and total follow-up periods were 5.6 years, 6.0 years and 11.8 years, respectively. At the VADT baseline we classified Kidney Disease: Improving Global Outcomes for chronic kidney disease (KDIGO-CKD) categories using eGFR in ml min−1 1.73 m−2 (estimated using the Modification of Diet in Renal Disease equation [see ESM Methods])  and albumin to creatinine ratio (ACR) in mg/mmol as: low risk (eGFR >60, ACR <3); moderate risk (eGFR >60 with ACR 3–30, or eGFR 45–59 with ACR <3); high risk (eGFR <45 with ACR <3, or eGFR <60 with ACR 3–30, or any eGFR with ACR >30) and ESRD (eGFR ≤15, dialysis or kidney transplantation) . For this interim analysis of the VADT-F we analysed several renal endpoints including eGFR, change in eGFR over time, doubling of serum creatinine, creatinine >265.3 μmol/l, ACR and KDIGO-CKD categories from the beginning to the end of the VADT, and from the beginning of the VADT-F to the end of December 2013. Means and SDs are displayed for the continuous variables, and the frequency tables for dichotomous variables. Group differences were tested by t test for continuous variables with normal distribution and by the Kruskal-Wallis for continuous variables with non-normal distributions. For the dichotomous variables, Fisher’s exact test was performed. For the treatment effect on the renal outcomes, multiple logistic regression models were used. ORs, 95% CI and p values are reported. We did not use survival analysis because eGFR and ACR can fluctuate substantially in some individuals over short-time intervals and may not reflect true progression. We were interested in the final outcome of each participant after a longer observation period; it was less important when the renal outcome event first occurred. A mixed random-effects model for longitudinal data was used to assess eGFR over time during the VADT and VADT-F. A sensitivity analysis was done to assess the consistency of the treatment effect after adjusting for blood pressure and lipid profile. All statistical tests used a significance level of 0.05, using SAS, version 9.3, for Windows (SAS Institute, Cary, NC, USA). At the end of the VADT intervention, the INT group had an HbA1c of 1.5% lower than the STD group (6.9% vs 8.4% [51.9 mmol/mol vs 68.3 mmol/mol]). This did not delay progression of renal disease in the entire cohort , although it slowed progression of ACR and decline in eGFR in subgroups . The 1033 people included in this analysis, 528 assigned to INT and 505 assigned to STD during the VADT, did not differ substantively from those who were not included (ESM Tables 1, 2). The average HbA1c difference between groups declined to 0.2–0.3% by 3 years after VADT and HbA1c was similar by the end of this analysis . At the end of the VADT-F, more people in INT maintained an eGFR >60 ml min−1 1.73 m−2 (OR 1.34 [95% CI 1.05, 1.71], p = 0.02) (Table 1). Participants classified as moderate-to-high risk for CKD at the beginning of VADT who received INT were significantly more likely to have an eGFR >60 ml min−1 1.73 m−2 at the end of VADT-F compared with participants who received STD (moderate risk: INT 51.5% vs STD 39.6%, RR 1.3, p = 0.03; high risk: INT 28.8% vs STD 12.5%, RR 2.3, p = 0.04). More people who received INT during VADT improved to a low KDIGO risk category by the end of VADT-F compared with STD (12.3% vs 4.5%, RR 6.1, p = 0.002). Post hoc sensitivity analyses using the Chronic Kidney Disease Epidemiology Collaboration (CKD-EPI) equation to calculate eGFR showed similar results (data not shown). There was no significant difference between participants who received INT or STD treatment in doubling of serum creatinine, creatinine rising to >265.3 μmol/l or ESRD during the VADT-F (Table 1). Mean eGFR was similar between groups at baseline of the VADT and declined equally in both groups during the follow-up period (ESM Fig. 2a,b). At the end of the VADT, INT had significantly reduced the odds of developing new albuminuria or progressing from microalbuminuria to macroalbuminuria, a difference lost by the end of the current VADT-F observation period (Table 1). Sensitivity analyses to adjust for baseline and follow-up blood pressures and lipids did not impact our findings. One of the most important questions for people with type 2 diabetes is whether tight glycaemic control reduces clinically relevant microvascular and CVD events in individuals receiving excellent blood pressure and lipid management. In this extended follow-up of the VADT, we found that more people who received INT maintained an eGFR above stage 3 CKD in a cohort of participants with advanced type 2 diabetes and CVD. The benefit was greatest in those who had a moderate-to-high risk of CKD at baseline by KDIGO, a better predictor of renal disease progression than eGFR or ACR alone . We compared our results to major published clinical trials of glycaemic control (ESM Table 3). The Action to Control Cardiovascular Risk in Diabetes (ACCORD) and Action in Diabetes and Vascular Disease: Preterax and Diamicron MR Controlled Evaluation (ADVANCE) trials, which included participants similar to the VADT, and the UK Prospective Diabetes Study (UKPDS), which enrolled individuals with newly diagnosed diabetes, did not show significant differences in final eGFR between INT and STD groups [2, 11, 12]. However, the Epidemiology of Diabetes Interventions and Complications (EDIC) study, a follow-up of the Diabetes Control and Complications Trial (DCCT) in individuals with type 1 diabetes, reported that significantly fewer participants developed an eGFR <60 ml min−1 1.73 m−2 in the INT group . In contrast to ADVANCE, the VADT-F, ACCORD and DCCT/EDIC trials did not find a significantly lower risk of ESRD with INT, possibly because participants had relatively preserved renal function at baseline. Like other trials, we found reduced development and progression of albuminuria with INT at the end of the VADT [2, 11, 12, 13], but this benefit was not maintained at the end of the VADT-F. However, it is possible that more of our participants in the moderate-to-high risk KDIGO-CKD categories maintained their renal function over time as a result of a reduction in proteinuria. Microalbuminuria is a risk marker associated with increased CVD risk and possibly CKD progression, but by itself does not indicate the presence of nephropathy, especially if the eGFR is >60 ml min−1 1.73 m−2 . A recent meta-analysis of the ACCORD, ADVANCE, UKPDS and VADT found that INT reduced the relative risk for a composite of renal events by 20% . However, another meta-analysis concluded that these major trials inconsistently show significant benefit of INT on clinically important outcomes, e.g. renal replacement therapy, stroke and CVD-related and all-cause mortality rates . The potential benefits of INT need to be balanced with the increased risk of severe hypoglycaemia and CVD-related death, especially in people with advanced age and other comorbidities. The current study has several strengths and some limitations. The VADT-F is a long-term follow-up of a well-conducted trial comparing STD with INT glycaemic control in people with advanced diabetes and prevalent CVD. Limitations of our study include that this is a post hoc analysis. Specific medicines for glucose and blood pressure control were not controlled in the VADT-F and we cannot exclude an effect on surrogate markers of renal function. The results may not be extrapolated to younger non-obese individuals with type 2 diabetes or women. In conclusion, this interim analysis of the VADT-F shows that INT for a median of 5.6 years may have a modest beneficial effect on delaying the progression of renal disease, especially in those with a moderate-to-high risk of CKD at baseline compared with STD. Similar legacy effects of INT were also reflected in a significant reduction in major CVD events after almost 10 years of total follow-up . Continued follow-up of the VADT cohort is on going. We thank C. Abraira and W. Duckworth for designing and co-chairing the original VADT. Support for obtaining data from the VA system or the Centers for Medicare and Medicaid Services was provided by the Information Resource Center of VA Health Services Research and Development (Service Directed Research numbers, 02-237 and 98-004). This manuscript represents valid work. Neither this manuscript nor one with substantially similar content under our authorship has been published or is being considered for publication elsewhere. VADT and VADT-F have been approved by the institutional review board of each facility where they were conducted and were carried out in accordance with the Declaration of Helsinki. Members of the VADT Study Group are listed in the ESM. The VADT participating cohorts’ data are available only to the collaborating scientists from the respective VADT participating centres. In line with VA policy, the data are not publicly available. The protocol (see ESM The VADT protocol for complete cohort follow-up) and the consent form do not contain language allowing us to share individual participant data except in an aggregate form since it could compromise research participant privacy/consent. The authors have full access to all the data in the study and take responsibility for the integrity of the data and the accuracy of the data analysis. Supported by the Veterans Affairs Cooperative Studies Program of the department of Veterans Affairs Office of Research and Development (VA CSP #465 and #465-F), a grant (P30DK092926) from the National Institute of Diabetes and Digestive and Kidney Diseases, and grants from the National Institutes of Health (RO1HL067690 and RO1HL094775). RAH is supported, in part, by grant number P30DK092926 (MCDTR) from the National Institute of Diabetes and Digestive and Kidney Diseases. The authors report no conflict of interest. The views expressed in this article are those of the authors and do not necessarily reflect the position or policy of the Department of Veterans Affairs (VA) or the US government. All authors made substantial contributions to the conception and design, acquisition of data or analysis and interpretation of data; drafted the article or revised it critically for important intellectual content; approved the final version of the manuscript to be published. GDB is the guarantor of this work.